Billy Gray has been selling plants at the Missoula Farmer’s Market for about 25 years! She has two businesses: Billy Gray Landscape Design and Grace Note Gardens. She does everything from garden consulations and recommendations to plant identification as a landscape designer. Billy Gray shares her passion and knowledge for caring for our yards and planet in a healthy way. I’m an independent gardner and business, I’ve been doing this since 1972. I do consultations and recommendations and plant identification, and I sell plants. Some that I dig out of my garden, and some I order in and grow up to be able to have a wider variety. 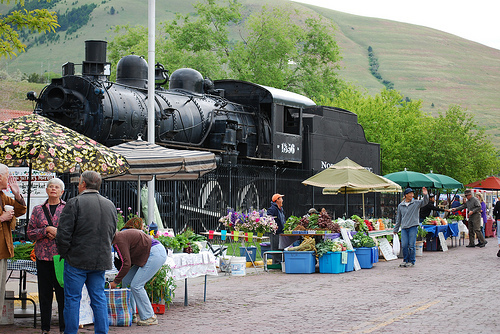 I’ve been happy to be in the (Missoula Farmer’s) Market I think for 25 years now! My mom was a great gardener. There were things she allowed me to assist with and I thought I was being very helpful and most of time she had to come back and redo whatever I did. I think I was about 5 or 6, and I think that that’s probably a lot of the same sort of events that happen when you’re a little kid. Then we moved around a lot and we had a lot of other experiences in different places. One of the best things I remember from that period was that she had a compost pile and she threw potato peelings and everything into it, and lo and behold potatoes would grow and it was always fun to dig out the potatoes! What does organic gardening mean to you? Improving the soil as much as it can be, as it can support magically of course, whatever you want to put in it, as far as your plants or your veggies or trees. Im a great one for feeding the soil good stuff and teach people if you don’t feed the soil there isn’t going to be anything in there. Montana has really rich mineral soil, but there’s not very much in the way of the organic factor, so compost is essential and good compost is sometimes hard to come by so best to make your own, if you don’t know what your sources are for it, you can get into trouble. We had a rash of bad compost in Missoula a few years back, where people were getting their compost from manures that the cows had been feeding on pastures that was sprayed with Tordon which never breaks down I don’t think so I can get pretty excited over that. Of course when they plant their things in it, it has a very bad effect on your produce. A common thread on this show has been making sure that your manure comes from animals that have NOT been fed weed-free hay. It’s a tough call and I think things are getting better, but it’s there! So it’s gonna be there for our life times probably and having bad effects on your produce. I belonged to garden clubs for a long time, and we had quite a few here in this area and they were very active and there quite a few people who went both ways with their things, and got quite excited about what was going on new that was introduced every year. I can’t say I’m absolutely entirely organic, I don’t grow things with a lot of chemicals, there are some herbicides are very touchy, but there are some things out there I don’t know what we’re gonna do when they decide to take over the world, the bad weeds that are so greedy and they just keep coming no matter what you do. Like spotted knapweed? Is that what you mean? No, unless you have acres of it that you have to deal with, how can you do a farm that has 500 acres of knapweed on it? You can’t even get from one end to the other if you’re trying to pull it. It is pull-able! It’s just that the seed is viable for 50 years, so keep it mowed! I think there’s some bugs you can get from the extension service that eat it. And sheep like to eat knapweed. And the sheep really like to eat the knapweed, but that of course, that’s the like pinching back a plant, if you take the top off then it sprouts again. And some of the bad weed stuff, if you cut it off I’m thinking now of the leafy spurge, and the cancer of the garden, Campanula rapunculoides, they have triple root systems. There’s the root group at the base of the stems where it comes out of the ground, you think you pull it off, it has a really pretty flower and so it’s has a lot of appeal for a lot of people. It was brought in with pioneers that came in. What happens when you peal that stem off, it has broken off from the roots that go to the white radish that is about 8″ down – 12′ maybe. It’s a double root that’s a attached to a long lateral root, that is probably out of sight it’s so deep.I have been in holes up to my shoulder and haven’t found the bottom. It’s a woody root, and I’m convinced here in Missoula which has a fair square mileage in it, it’s about 50 square miles, and I’m convinced the entire county is all the same plant! I think bindweed and leafy spurge and that all have the same characteristics, very difficult! I don’t know what to do with it, you can control it, you can cut it down, I know you can cut it off, but I find that it pops up elsewhere. They have a node that runs along the lateral root, and it grows rapidly. Even if you do spray it with something noxious it knocks it back, and it’s prevented form doing things for a few years but then it comes back! One thing I have found with spotted knapweed, the best thing we can do is having a healthy lawn. The best thing we can do is keep things watered, and keep the soil healthy. Last summer was difficult, spring was so late, and then it got os hot things didn’t know what to do, and now we are at the hottest part of summer and July 2nd today we’ve already had hot weather with triple digits, and that’s unprecedented! Probably not anything much different from what I am doing. I’d like to see if I can find some more ferns. I had a really good source of our native ferns, but she passed away which is sad and now nobody is doing that. She collected the spores and started them from spores, which is kind of tedious and long term. You have to have things set up just right. Tell us about growing ferns. Some will grow in the sun but most of them are shade lovers. It’s a funny thing when you start out with a new house, and it’s a new lot that’s bare, and you plant trees, and eventually your trees grow up, so your environment changes drastically. People really don’t consider that, when they’re starting out or when they buy a house that has young trees on it and they don’t realize the trees are gonna get big so they don’tt have the sunny areas they started with so they either have to change their environment, or cut down trees, but that’s a terrible contemplation so you change over to a shady garden. Shady gardens are very very nice to have and I promote them a lot! I had a boss one time that did a commercial for his business that was a very nice garden center, and it was him being Aristotle and making those profound statements like “the best time to plant a tree is 20 years ago, and the 2nd best time is now,” and I sort of live by that. The biggest thing that happened to me last year, I have a small greenhouse and I heat it with propane, and I have a very nice company that comes and makes automatic deliveries and keeps track of me, and takes really good care of me and in some period in the last year, they were bought out by another company and somewhere in the changeover, my bill account got dropped and I was not aware that there was no delivery, and so we ran out of propane and it was in the middle of the coldest season of winter and that was very sad, and it was a wake up call for me, be more aware of what’s going on in the winters. So I put the things to bed and cover them up I tend to hibernate in my house and read a lot. So time went by, I went to start them up in March and that was a very bad surprise. I caution people to pay attention to what their doing. I think one of the best things I’ve got that are kind of happy, unfortunately I say that, and everything that is like that requires some attention also. Things like Coreopsis Grandiflora is a very happy plant and is easy to grow and loves the sun and produces from this year it’s gonna be June, usually starts in July is gonna grow through frost if you keep it deadheaded, the thing about that is you have to go out and deadhead it. You want to leave a few at the ends to go to seed because it is a biennial. It’s a good cut flower its so sunny, it’s gold in color, yellow, but not a soft yellow, a bright yellow gold, and it is prolific, and it is probably one of the best things I have as far as looking good. Do you want to explain what a biennial is? A biennial is that it has a two year life cycle which means the first year it will produce a rosette, a lot of our favorite flowers are biennials. Hollyhocks, and most of the pansies, and Sweet Williams, foxgloves are all biennials, so they prodcue their first rosette in the first year, the second year they produce the seed and then they die. It takes two years to get a cycle started. Then they bloom pretty regularly after that? When they bloom they have long periods of bloom. They die, they only live for 2 years, then they die altogeher, but their progeny if you pull out some to go to seed, will produce the next generation. I mean ours keep coming back and they just bloom over and over we haven’t planted them in years? Sweet William is a variety of dianthus, the pinks are others and those are perennials most of them. The Sweet William is a biennial. Some hae a little longer of a lifecycle because some of the hybrids are much more long lasting then the species variety. No, they seem to like most of what I got. We were really busy on the gas plant when it was in bloom. It’s a wonderful perennial. A perennial is, once it starts, it does grow on and some are longer life then others, peonies for instance, are generation, they go from one people generation to another generation. Like people brought their grandmother’s perennials with them when they moved. Once they start producing bloom then they will do that for their season every year. Many things are early mid-season and late within their blooming season. Which so you can have a long blooming period, iris or day lillies have a long season of bloom. Iris will start blooming in March, the real early ones, the bulb iris the little danfordiaes and the reticulatas start very early they bloom with the crocus. The next are the bearded miniture dwarf and then standard dwarf and they are progressive with their season. Now we have reblooming iris that will start again til August to bloom, after they have a rest period, for us our peak bloom time is June. What we’ve learned over the years, there’s an awful lot of nutrition in those stems so don’t cut the stems, cut just below the bloom head! Don’t cut the stem because the’re an lot of groceries in the stem, until it turns brown, and then you can take it off. The ones that are re-bloomers will bloom again, but it requires them being watered and fed. Then they rebloom in August. Fairly recent, perhaps 20 years they’ve been on the market now, they started in California,now they are hardy enough to get through our season. Some are fairly reliable. I don’t know which ones are hardy enough for our weather. The same thing going on now with the daylilies. There are thousands of varieties! There’s one that’s been a good seller for me, Stella de Oro. Mine is Happy Returns. Now there are more lots that are awesome. Do you have some successful tips for selling flowers at the market? IDK because I don’t do cut flowers. The people that I do know, sell out, they just all sell out rapidly, as long as they are in a bouquet and your price is good. 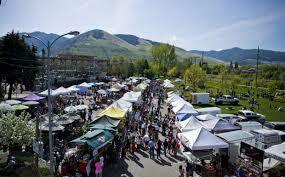 That could be the Missoula Farmer’s Market though, it gets a big crowd. There’s a lot that, it’s not one of the more essentail things but lots of people boquests because they like the cut flowers. So you’re selling the actual plants more then bouquets? That might be a good thing they might want to look into, selling plants more then cut flowers. Yes, it’s a good suplemental income, I wouldn’t depend on it for a living, but it helps. You said you started selling out of your yard? I have a wonderful fern, I call it a thug, because it does spread. It’s an ostrich fern, it’s a great fern if you have a lot of room for it, it can be very dramatic, and if it puts out too many progeny you can just give them away until people are sick of them, then you can just compost them, they’re beautiful. They can get 4-5 feet tall. They can get very dramatic. Kind of like a large sword fern, but they are softer fronds then the sword fern are. If when I’m dreaming about it, I can take my cup of tea out and wonder thru and not be compelled to pull all the weeds I see. One of the things that I learned, I don’t know that I have ever have anybody actualy tell me to formaly to do it, to do some exercises before you to go out and start in the garden, because we get a little lax about that kind of thing and especially before we go out in the spring, before we get out and start weeding and pulling. I do think gardening and weeding is a lot like yoga, doing a lot of stretching and things. I can zone out just perfectly, there is no world other then the things I’m trying to pull out. My dandelion digger. I do a lot with it. One of the best authors we have going right now is Lauren Springer. Especially for people living in the mountains, her very first book was written when she lived in Gunnison, CO. She has several books out now. Zone 4 Magazine is a terrific publication. And I like Fine Gardening Magazine also. Stopping Fracking! There’s an organization, that I get their newsletter, Food and Water Watch. I get that in the email too! Do you want to explain to listeners what Fracking is in case someone has not heard of it. I’ll give a brief overview. Fracking is basically a way of extracting, either natural gas or some kind of thing we are going to use for energy. What they do they pour all this nice fresh water into the holes so the drills can spin, and they add these toxic chemicals and even after they extract, natural gas or oil somehting that is going to make our homes warm or cars run, and its really just toxic for our world. People that are living where they are fracking are having huge problems with their water, you can see the experiments on tv where they’re lighting their water on fire (at 1:10 the water combusts!) that kid (Josh Fox) from Columbia (University) who did the Gasland movie on HBO, if you haven’t seen Gasland that’s a great way to learn about Fracking. And the worst part about it is after they’re done, the water that they’ve used is totally toxic and has to be capped underground. WE have to find a better way to solve our energy needs. Well we’re gonna run out of water, it takes millions of gallons per well. Millions and millions of gallons. The people who live in places where they’re fracking, they’re working on it, states are banning it. Word’s getting out, and there’s lots of competition for it. Lucille if you want to live a nice long life, take care of yourself, eat right, exercise, etc and plant a garden, because if you do that you will be forced to look ahead, and heart patients tend to be depressed, thinking their life is over. You can’t be a gardener and not be an optimist, you can’t put the seed or plant in the ground and you plant it and you expect it to grow.